Ever since the 1700s when Ben Franklin published the nation’s first best seller, Poor Richard’s Almanac, Philadelphia has been a haven for writers and literature lovers. 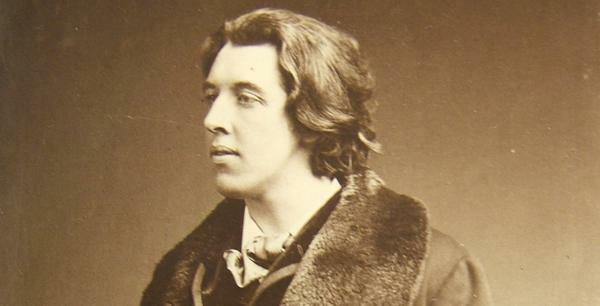 2015 will be a banner year for books with four exhibitions marking the 150th anniversary of Alice in Wonderland as well as a celebration of Oscar Wilde, and a day-long reading of Ulysses. But any year is a good time to see the newly renovated museum devoted to Ben Franklin and his printing office, visit the home of Edgar Allen Poe, and admire two world class collections of rare books, first editions and manuscripts that can be seen only in Philly. The Ben Franklin Museum in Philadelphia. 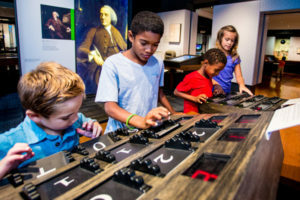 A good place to start is the Benjamin Franklin Museum, reopened in August 2013 after a two-year total “re-imagining” of the former Underground Museum built in 1976. Now as vibrant as the man himself, it uses interactive exhibits to portray the many facets of this remarkably versatile Founding Father—inventor, writer, publisher, politician and patriot. The house where Poe lived in Philadelphia. It is said that Poe may have been inspired for his most famous poem by seeing “Grip,”a stuffed raven belonging to Charles Dickens, who met Poe when he visited Philadelphia in 1842. “Grip” now resides in the Rare Book Department of the Free Library of Philadelphia, along with the only known copy of The Raven in Poe’s own hand, and the manuscripts for Annabel Lee and The Murders in the Rue Morgue. They are part of the Poe Collection of Richard A. Gimbel, one of many bequests that make this department richly rewarding for anyone who loves books. The letters of Charles Dickens, letters of the Presidents, and one of the largest collection of Beatrix Potter memorabilia including 100 watercolors and drawings, are among the treasures to be seen here along with a remarkable assemblage of earliest books. Holdings include Early American children’s books, first editions of Elizabeth Barrett Browning, Joseph Conrad, Arthur Conan Doyle, Robert Louis Stevenson, George Bernard Show, Mark Twain, Oscar Wilde and dozens more. 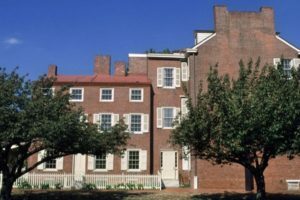 A highlight is the lovely reconstructed 62-foot long Georgian paneled library of William M. Elkins, whose bequests also included major collections of Oliver Goldsmith, Charles Dickens and important Americana. Dickens’ own desk is displayed in Elkins’ library. Guided tours of the Rare Book Department are offered at 11 a.m. Monday through Friday. Rosenbach Library. Photo by Eleanor Berman. An even more amazing trove of rare books can be seen at the Rosenbach Library, an elegant 1860s townhouse holding the personal collections of Dr. A.S.W. 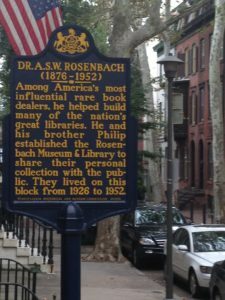 Rosenbach (1876-1952) one of America’s most influential rare book dealers who helped build many of the nation’s great libraries. Rosenbach’s prize possession is James Joyce’s hand-written manuscript for Ulysses, but the collection also includes Shakespeare’s 1664 folio, 600 Lewis Carroll books, letters, photos and drawings, first editions of Don Quixote, notes and outlines for Bram Stocker’s Dracula and most of poet Marianne Moore’s manuscripts and correspondence. 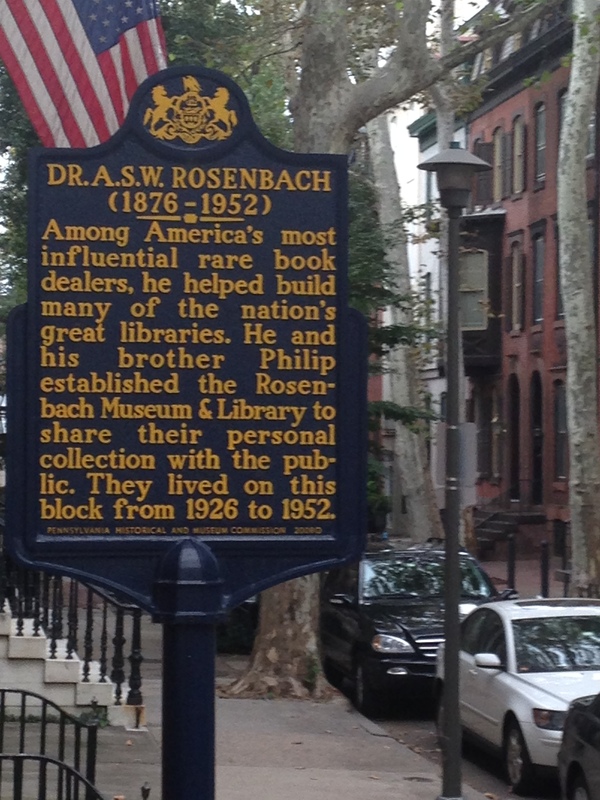 Now part of the Free Library, the Rosenbach holds continuous exhibits. Bescribled, Nibbled and Dog-Earted: Early American Children’s Books, featuring its enormous collection of children’s literature is on through January 18, 2015. It will be followed by Everything is going on Brilliantly:: Oscar Wilde and Philadelphia from January 21 to April 26, 2015, highlighting Wilde’s connections to the region through rarely seen material and works held by local institutions and private collectors. The Dream of Wonderland: Alice Turns 150 celebrates the 150th anniversary of Alice in Wonderland, featuring the Rosenbach’s unmatched Carroll collections. They include more than 600 of his letters, his early drawings, his own copy of the first edition of Alice and the book’s original woodcut illustrations by artist John Tenniel. One of the most delightful of the exhibits on Alice in Wonderland is Why is a Raven like a Writing Desk: Lewis Carroll’s’ Riddles Puzzles and Games, showing off the whimsy and wordplay the author loved. For over 20 years the Rosenbach has celebrated Bloomsday on April 16 with a free, all-day outdoor reading from James Joyce’s Ulysses (the book is set on that day in 1904) This has blossomed into a citywide celebration with readings and musical performances all over Philadelphia, an unusual people’s celebration of a great work of literature in a town that loves books.